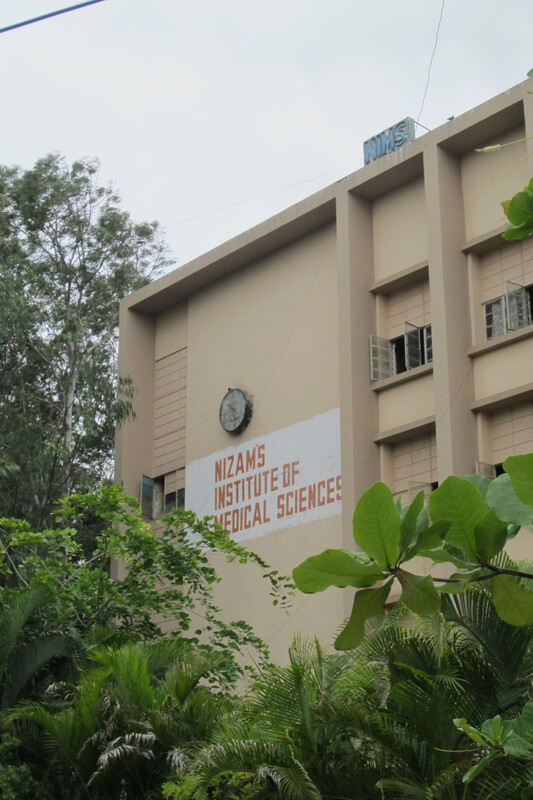 Our primary focus of this past week has been to immerse ourselves into the world of NIMS (Nizam’s Institute of Medical Sciences), a hospital that cares for the very patients that I spoke about in my last post. Greater than 90% of the patients at NIMS qualify for government aid based on their income, allowing for treatment of up to 2 laks (~$3000 USD) per year, which goes surprisingly far in India (for example, Burkitt lymphoma can be treated for ~$10 USD). Over the past week we have experienced a broad view of the hospital: from the oncology clinic, to the inpatient wards and step-down unit, to the microbiology and serology lab. On first glance, the hospital appears like any other limited-resource hospital I have worked in: slightly dilapidated with patients congesting the hallways, appearing to be uncared for. It’s easy to focus on the disrepair of the facilities: the crumbling cement, broken windows, exposed electrical wires. However, under this unkempt surface lives a world of organization, dedication, and commitment to serving the underserved of Hyderabad and the surrounding area. For a hospital with limited resources, day to day activities run surprisingly smoothly, the spirit of academia is preserved, and quality patient care is delivered. Perhaps NIMS may be the Boston Medical Center of Hyderabad, providing “exceptional care, without exception.” The successes of the hospital do not come by chance. The hard work and determination by the faculty and residents is palpable. One could imagine that the microbiology staff would become frustrated by the lack of proper equipment and space (this lab that provides services to a 900 bed hospital lives in a small, cramped space). Rather, the staff are enthusiastic, the records are well maintained, and the system is meticulously organized to ensure that proper technique contributes to appropriate treatment of the patients. In a similar vein, rounding on the medical wards could seem arduous and even ominous without adequate staff (1 nurse cares for 16-18 patients) or access to medical literature/resources (UpToDate or PubMed are not readily available in the hospital). However, discussion between residents and staff is thoughtful and robust, physical exam skills are refined in order to limit the use of unnecessary tests, and colleagues from other departments are utilized when the answer is elusive. 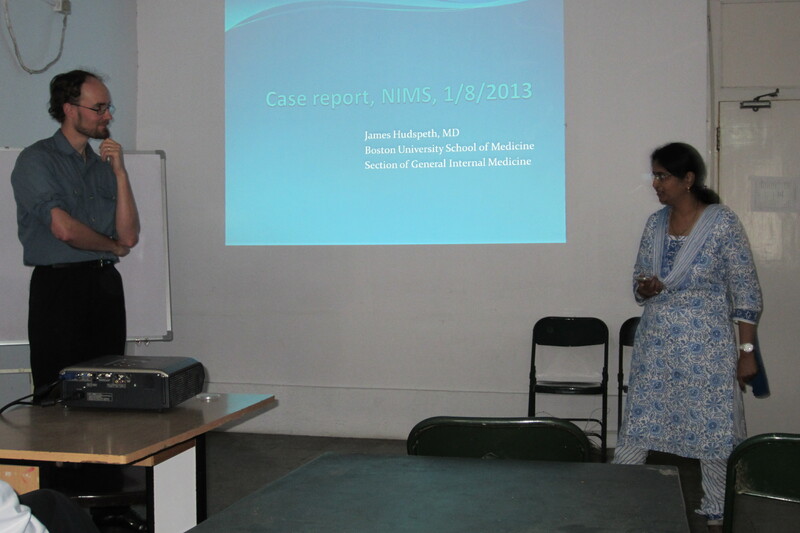 In fact, one of the goals of the hospital is to “develop patterns of teaching in postgraduate level and in super specialties so as to set a high standard of medical education.” This commitment to higher education and academia was easily apparent during a case based presentation given by Dr. Hudspeth to the entire medicine department at NIMS. The students, residents, and faculty were fully engaged and participatory, eager to soak up any knowledge offered by their American colleagues. While I chose Boston Medical Center specifically for the patient population it serves and for its mission statement, over the past year I have often found myself getting weighed down in the frustrations that come with working with such a population, questioning whether my hard work is making any difference at all. And this is in a setting with nearly unlimited resources and support. Seeing the way that my India colleagues encounter similar frustrations (albeit on a MUCH larger scale) yet still remain determined and passionate has reminded me both of the reasons I chose to train at BMC and of the reasons I chose medicine in the first place. I will forever be grateful for the generous people at NIMS and for the enthusiasm they have revived in me.